So we've stepped out of our comfort zone a little bit. But isn't that what it takes to grow your business? Putting yourself in a situation that is different than what you're used to, so you can learn and grow. As we continue to move forward and plan ahead for our real estate investing business, one of our major goals is to start working with partners and creating relationships with banks. While we have bought two properties in the recent months as our first partner deals, we also decided to start meeting with banks to get access to a line of credit that we can use in future deals. That's exactly what we discuss on the show. We felt that there may be a lot of you out there who may eventually want to get to a point of growing your business who may be interested in just how we went about doing this. 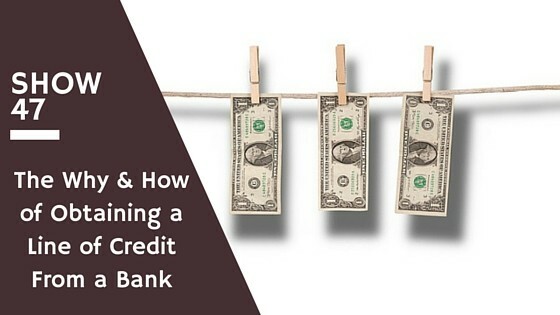 So tune into today's show to learn all about gaining a line of credit from a bank. Congrats on successfully getting the line of credit. I bet they were impressed you came in so prepared, I’m sure they get a lot of people coming in that are completely disorganized and don’t know their numbers. Thanks Brian! Yes, we are excited about having access to the funds. Now we just need to find the right property!